Travel in the quality comfort of our company SUV around the local region to see 2 light houses. West Point is in Seattle, on a sandy beach. 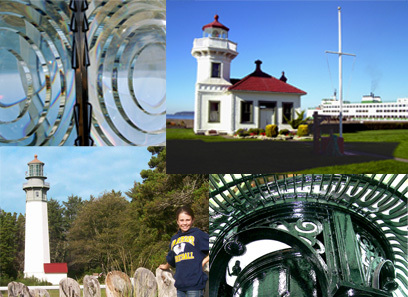 Depending on whether you booked for a Saturday or Sunday, you'll also visit either the Mukilteo lighthouse or the Browns Point lighthouse. The last two mentioned are the ones you can actually go inside. Lighthouses saved lives in the 1900s by providing a beacon of light to point out shallow water, or points in the topography so ships could navigate safely. Puget Sound is carved out from a glacier ending about 13,000 years ago, and Puget Sound is formed on the bottom with shallow and deep ravines and shoals.